This fishing trip was not planned a long time in advance. Also, after being lied to by the BBC weather lady (thanks Carol), the rain that was forecast never arrived, and instead it was ruddy freezing! 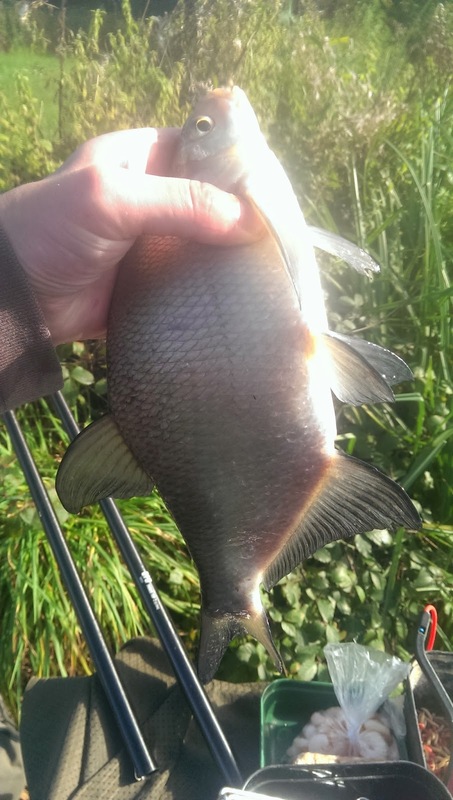 After a bit of indecision, some goading from friends and last minute packing I resolved to go fishing and try my hand at catching some specimen Perch from Cefn Mably’s Horseshoe Lake. I would be taking some frozen prawns and luncheon meat, but would need some maggots to draw the small fish in. Fortunately I could buy them from the excellent tackle store on site. Hungry carp were on the feed despite it being only 7 degrees! After buying a pint of maggots I headed down to the Horseshoe and was very pleased to see my favourite peg was free. Walking around the lake I couldn’t help but notice, that despite the 7 degree temperature the carp were still very much on the feed. Before setting up I threw a few good handfuls of maggots into the margins on my left and right and set up my quiver tip rod on a plain bomb set up. I would be using 8lb mainline, (fairly chunky stuff but, carp and tench will happily take prawns) with a small ½ ounce squared lead before my N-Gauge 0.19 hooklength (7lb) and a hefty size 6 hook. After hooking the Prawn, all that was needed was a small under arm flick into the right side margin and I was fishing! 10 Minutes past and despite getting some line bites, nothing had gone for my bait. Looking out across the lake, there were plenty of fish cruising around and slowly the temptation to start Pole fishing crept into my mind. With that thought, my rod tip ripped around and on striking I felt the kick of a nice fish under the surface. The fish knew something I didn’t and dove straight into a snag! One good thing about using quite heavy line is with enough persuasion the snag soon came free and with a bare hook I removed from my swim the skeleton of a long dead bush. 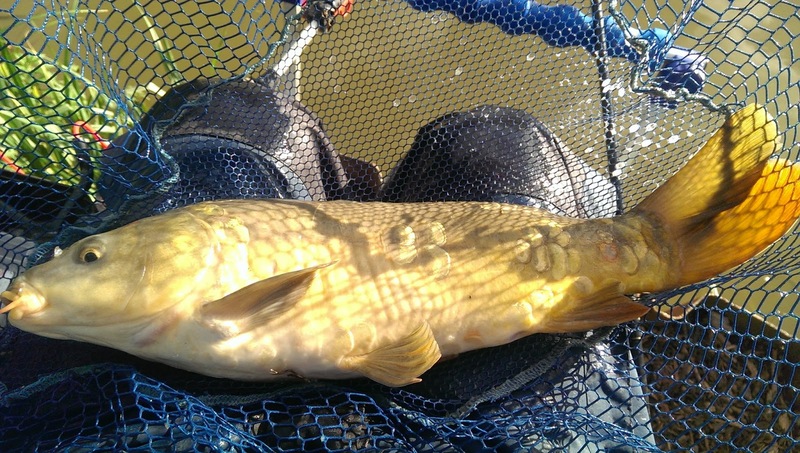 A few more handfuls of maggots into the swim and a re-baiting with a prawn, and I was fishing once again. The next bite came fairly quickly and this time I had the fish away from the bank and despite its best efforts, in the net quite quickly. 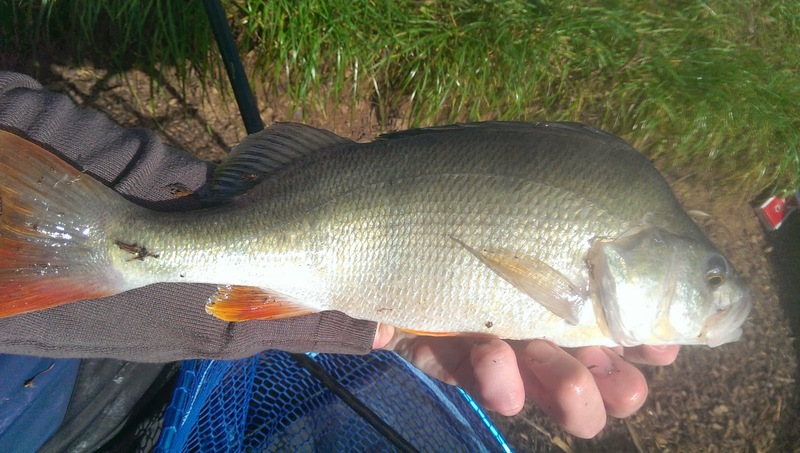 Neatly hooked in the scissors, this was easily a PB Perch for me – A nice fish of around 1 ½lb’s. Repeating the process, I began waiting once again, hoping for the fish’s bigger brother! 15 minutes past and the rod tip whirled around again. 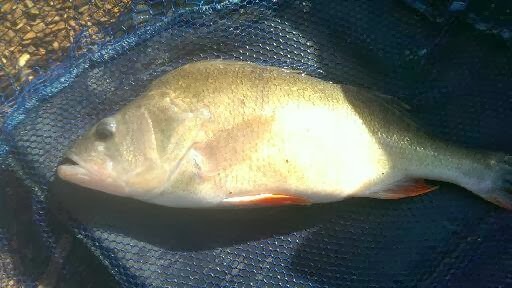 I was into another Perch and this one was bigger. A great fish between 2½ and 3lbs. This was turning out to be a productive morning. 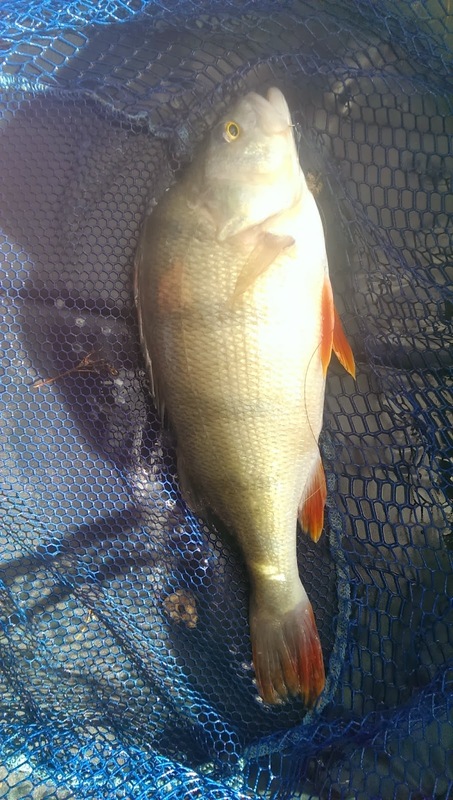 Another smaller perch of around 1 ½lbs followed, but after that the swim went very quiet. Switching swims so I was now fishing up to the tree on the left of me, I re-cast narrowly avoiding catching the tree. Phew! Leaving my bait exactly where it landed I began waiting; the rod had barely reached the feeder rest when an affirmative pluck showed I had a fish on. 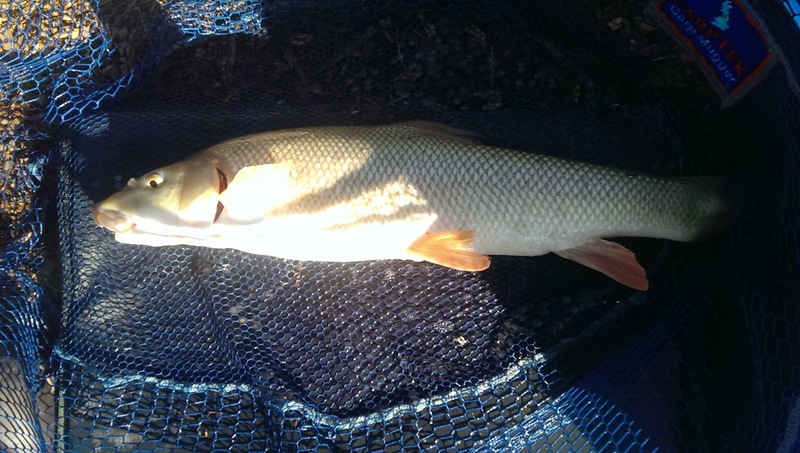 Another fish of around 1 ½lb came to the net. These fish were very hungry. Re-casting and switching both hook sizes (6 – 12) and bait (prawn to meat) I sat the rod back down and recommenced the waiting game. 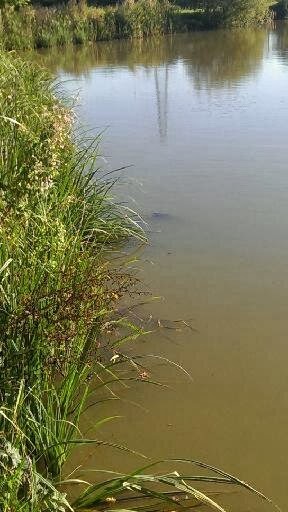 If anyone has fished the left corner peg of the horseshoe lake you will know that it is stuffed full of fish, and within 15 seconds the rod was almost ripped out of the rest by a greedy carp. After my last trip to Cefn Mably, and the success I had from the same peg the temptation to fish the pole soon became too much. I quickly adjusted my gear and set my Pole up at 13 meters, shipping out a small cube of meat. The Skimmers of the lake were obviously on the munch and I had 10 fish in quick succession. Using a larger piece of meat meant that something big picked up my bait and sadly I lost the fish. I started to wonder whether my chosen elastic were any good (Preston Solid Latex). A few more trips should help me determine that answer. Landing a small carp around 4lbs on the second attempt, I discovered I had no back up rigs if another fish decided to snap me. With that in mind I reluctantly stopped fishing the pole and spent the rest of the afternoon fishing back on the ledger. Switching between Prawn and Meat yielded devastating results, and although I didn’t catch another Perch that session I did catch 2 Barbel and 13 more carp, all ranging between 4 and 8lb’s. I left the lake feeling incredibly happy with myself. 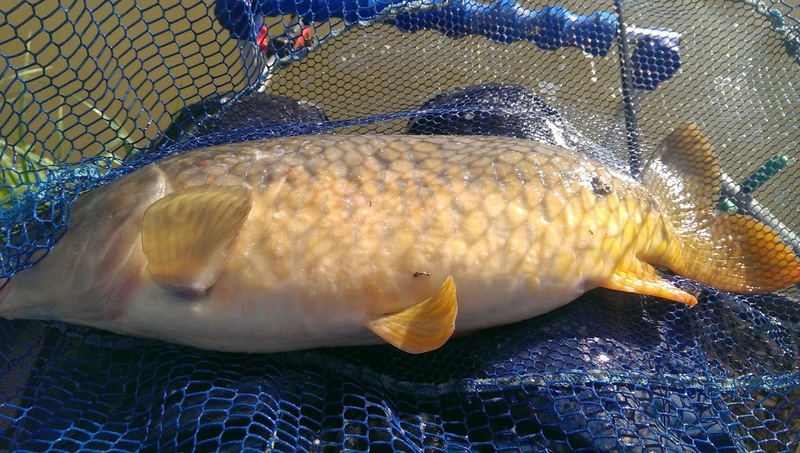 Not only had I beaten my own PB for Perch twice in one trip but ended up catching the best part of 80lb of Carp. Here are some of the fish I got out from under that corner tree! In future when fishing, if I intend on feeder or waggler fishing, I will leave the Pole equipment at home. 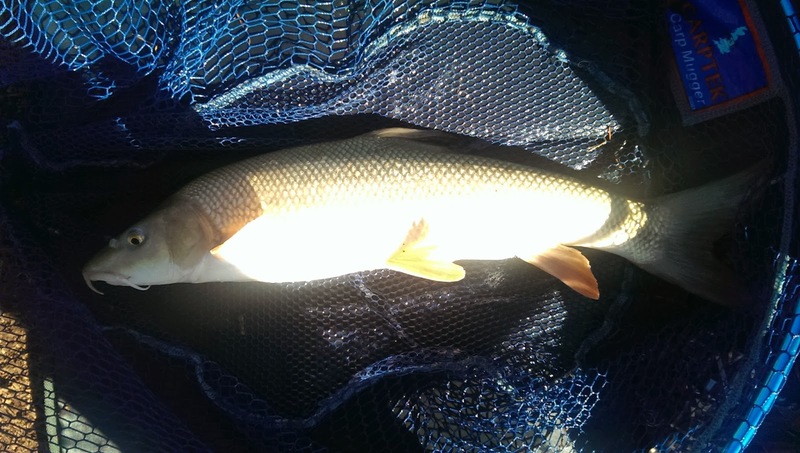 As using the Pole is my favourite method, I have until recently neglected other methods, and subsequently my Waggler and Ledger fishing had become a tad sloppy. That has changed, but I will continue to keep practising these other methods, and keep well practised in all methods rather than going with the favoured pole. I finished the day with this lovely Ghost Mirror carp! Cefn Mably never fails to deliver an excellent days fishing, whether you are chasing some Predators like I was, or filling your keepnet with a fantastic number of silver fish and Carp. You will almost certainly have a good day on one of their lakes. I will be revisiting the venue soon, when I take Guy in search of a ton bag. what make and size of pole do you use. Hi, I have 2. An old warrior of a pole in the shape of a Shimano Technium 12.5m which is rarely used but has thick solid elastics for lumps. But generally I use a MAP F-16 Commercial Fishery pole. It has taken a hammering, goes to 16 meters (but I have never used it at that length) and take up to an 18 elastic which is about as heavy as anyone would want to go really. Unless of course you had a specific Carp/margin pole. If you need any help/advice in regards to getting a pole be all means please give me a shout on the contact page. 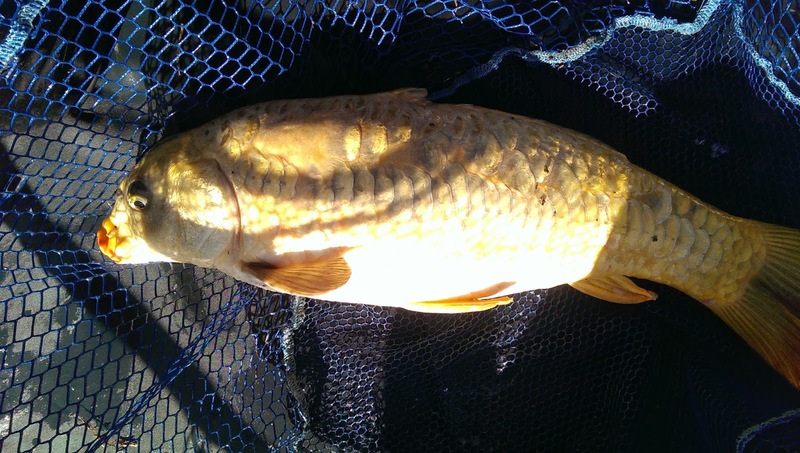 Next story Trip #47 – Last of the Autumn Carp. Previous story How to connect and disconnect your line to a Dacron Connector. Double loop method.